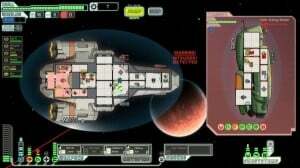 FTL is a simple, but enjoyable, part turn based, part real time, space sim. Unlike most games that show you an external view of your ship FTL is based on the internal view of your ship. You can see the crew at work and assign them to different stations on the ship; when something is damaged you send the crew to deal with the problem, putting out fires, fighting boarding crews and fixing damaged components. The aim of FTL is to first get your ship from the left hand side of the map to the right to deliver some crucial information. The turn based side of things comes into play when you travel from one node to another, as you jump the enemy forces are chasing you and each jump/turn sees them advance further. This means you have to choose between facing across the map and exploring the system you are in. Exploring is a key part and can be bother rewarding and frustrating. It’s the only real way to get upgrades for your little ship, improving the ships capabilities such as weapons, shields, or adding new abilities such as a cloak or transporter to beam crew to an enemy ship. When you first enter a new node an event box will happen, often giving you set responses which influence the outcome. Keeping this general so there are not plot spoilers, you might be asked how to handle a particular situation and the outcome could result in gaining a crew member. As there is no real skill to these situations you can often end up with a damaged ship or killed crew member by selecting the wrong option. It would be great to see the crew element made better use, perhaps with small sub games that allow you to influence the outcome of the event. Alternatively you might be faced with ship to ship combat, and this is where the real time element comes into play. You target the other ships systems (such as weapons or environmental control) and have to wear them down, whilst simultaneously managing your own damage. This can get a little overwhelming against more advanced enemies that send boarding parties over and it can be easy to quickly become lost in the action due to the level of micro management required to keep things ticking over. This is an enjoyable little diversion, but one that quickly frustrates and offers little replay value. There is a gem of a game idea on display, if the developer could expand on the game play by making more of the in system challenges, and potentially offer a way to reduce the sometimes overwhelming micro management (for example get the crew to act on their own to repel boarders and fix problems) then this could be an amazing game. OK it might be a bit too much to ask for The Sims in space (with lazers!) but this is a really different type of space SIM and the developer must be applauded for that.